The interactive board which has replaced the aged-old blackboard in the class has made the science subject for Grade 11-D students of Taxila Central College, Horana, more interesting. Clear pictures related to the lesson give them more understanding about the lesson and no one feels bored or finds themselves yawning. “Now I like the science lesson more than I did earlier. It is easy and clear to learn via an interactive board,” Harshini Koshila says. She says that rather than memorising the texts in the lessons, the interactive board system engages students in the lesson as the teacher-student interactive is present throughout the lesson. The presentation made about muscle tissues and variety of muscle tissues of the human body display on the board are taught in clear pictures through a projector. The facility of drawing pictures and writing texts given to their science teacher Sepala Welisarage is also an added advantage of this learning system using the interactive boards. Unlike on blackboards where the students have to use a duster to erase and rewrite, the interactive board learning is hassle-free and interesting for students as it runs on touch system. Koshila doesn’t have computer facilities at home but she is anxiously waiting to come to the Science Lab for the interactive session, which is scheduled once a week. “I like it as I can see many pictures related to the subject. I can’t see them in the book and it helps me to expand my knowledge of the subject,” says the teenager who comes from a poor family, where her father earns a living as a carpenter and the mother works in a garment factory. Helping shoulder the financial burden of the family, her elder brother who studied in the same school is now employed in a laundry. The Information Technology subject and the latest digital additions like the interactive board facility to the smart school concept of the Ministry of Education have influenced her to do IT for her higher studies. The ‘Smart Schools’ project is a sustained long-term program to raise the IT literacy levels of school children in Sri Lanka and to augment their learning via digital education. The project seeks to expose traditional classroom teachers and students to the latest digital learning technology and systems, stimulating wider use of IT in schools. This program dovetails well with Government initiatives to promote IT literacy and digital education, including the proposed donation of tablet computers to students. It’s not only science, mathematics is also taught using the Learning Management System (LMS), which is funded by Commercial Bank through interactive boards at the college. “This system is popular among students as they enjoy the lessons,” Physics teacher Deepika Karunarathna says, explaining how they use interactive boards in teaching effectively. At the Science Lab at the College, Karunarathna logs into Guru.lk, Sri Lanka’s leading e-learning portal, to do the science lesson on ‘Properties of Waves’ for Grade 11 students. Guru.lk is a multi-stakeholder initiative to convert 65 schools in the Western Province into ‘Smart Schools’ capable of deploying digital learning protocols. 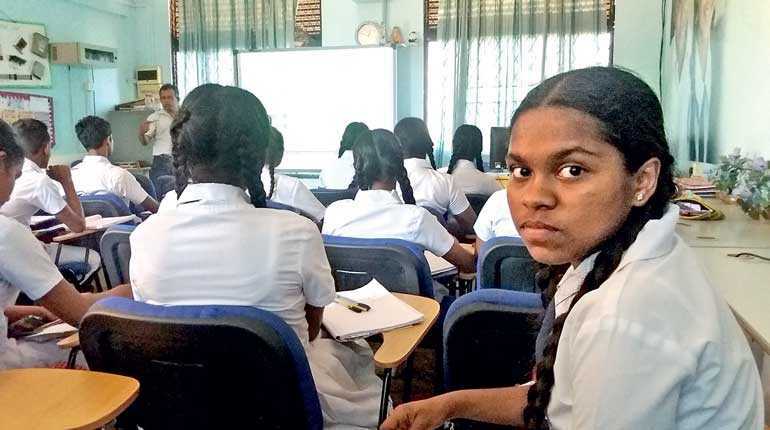 Commercial Bank together with Microsoft Sri Lanka and the Western Province Education Ministry took the lead in transforming schools to smart classrooms, trained teachers and provided hardware and software required for digital education. Commenced with the objective of transforming traditional classroom-based teachers and students to the latest digital-based learning technology and systems, stimulating wider use of existing IT infrastructure in schools, today the lessons have become popular and a ‘not to miss’ sessions among students as it helps them to learn fast. Under this project, the schools are given the content to use on computers, a learning management system, Microsoft Office 365 licenses, technical support and training on working with technology for education. Pasindu Imesh, a Grade 12 student in the mathematics stream, is the Leader of the team which repairs computers in the lab and also solves their issues in digital programs. “I used to dismantle and fix computer hardware at home as my father had brought some broken computers and laptops for me to learn repairing them. I gained lot of knowledge on repairing computers after I got the training at the school. Now our team repairs our own computers and we train our juniors to take over the task when we leave the school,” he says, while removing the hard disk of a broken computer. The Commercial Bank has provided necessary tool kits and the training was given by CISCO and the University of Moratuwa. Taxila Central College Principal K.K.P.M. Jayatilake says that the Smart School project facilitated by Commercial Bank has helped the students to do their own innovations using new software. “They are keen to learn and do experiments. Since they are now in touch with more sophisticated technology, they have become innovators. Recently they have experimented with a new system where the teachers use identity cards with their names and the time they enter into the school instead of signing an attendance register. It has proven to be a successful system and they can monitor the function through a software program,” she says. As a part of the social responsibility agenda of Commercial Bank of Ceylon, it has already donated computers, printers, furniture and other equipment to set up IT labs in 175 schools in Sri Lanka, under its IT education program. More than 160,000 students, most of them from rural areas, are now learning in IT labs. Meanwhile, the innovative online education program which was launched by the bank helps over 20,000 students from 20 schools to get access to carefully-selected mathematics and science lessons via a specially-created web platform, to supplement their regular lessons in these subjects. Moronthuduwa Dammananda Central College in Horana with 1,100 students is another rural school, which comes under the Smart School project. “The majority of students are from very poor family backgrounds. Their parents don’t have means to send them for computer classes. After we were selected to get computer facilities, teacher training and latest digital technology for students from Grade 6 to 11, the attendance rate has increased,” says School Principal A.Y.P. Perera. Within a short span of two years, competing with all the popular schools in the Western Province, Dammannda Central College has been listed among the top six schools which have excellent computer literacy under the Smart Schools concept. “This achievement has earned us a good reputation and most parents now want to admit their children to our school. Even the children who have got through the Scholarship exam have decided to stay in the school because of the excellent digital education at the school,” she says, explaining how private sector companies like Commercial Bank helped the school record the achievement. Under phase 1 of the ‘Smart Schools’ project together with Headstart Ltd., Commercial Bank, Microsoft Sri Lanka and Dialog Axiata, under the supervision of the Department of Education of the Western Province, are completing the transformation of 65 schools for digital learning. Headstart deployed 195 trained ‘ambassador teachers’ to train more teachers to ensure the smooth functioning of this e-learning project. There are over 6,500 trained teachers in 65 schools to guide digitised learning, with facilitates to upload nearly 35,000 files to OneDrive and LMSs. Grade seven student H.T. Thusitha Chamara was busy with his team of friends at the Language Lab/IT Lab solving a mathematical question given by their teacher Dulshan De Silva. They were given a few minutes to answer the question using a new software program they innovated. “I have a laptop at home but we don’t have internet facilities. 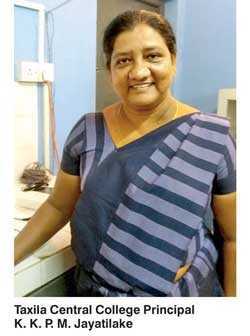 I am learning computer science during the IT period,” Chamara, whose father is doing a small business, says. Within the given few minutes most of the teams in the lab got answers and were trying to compete with each other to announce the results first. “We love to learn more about doing mathematics with this program. We like to learn science too. When we are learning through the digital screen, it is much clearer and not boring,” Chamara and his friends say. It was very encouraging to see the talents and skills of these schoolchildren, which were withering due to lack of technology and facilities, now blooming thanks to few private sector companies which want to bring a change to the society by doing things differently.